He was born in Chinatown, not quite two miles from City Hall and, starting at around age six, went to work in his family’s grocery store at 15th and Noe. He also worked alongside his father in a side gig as a janitor at a nightclub on Broadway (as an adult, Yee’s educational nonprofit actually bought this building and ran a daycare out of it. Upon walking in, he instinctively wandered over to the urinals he used to clean out as a child). Yee struggled with a speech impediment and was quick to his fists when teased about it. He learned to keep quiet (he’s still quiet). He was a marginal-at-best student who, admittedly, read his first book in high school. Colleagues and authority figures alike pegged him as inarticulate and none-too-bright — a man with limited horizons. Even his own family didn’t understand why he’d pursue a diploma. Just do your job. Just go to work. Yee blossomed at City College. He earned admission to the University of California at Berkeley and completed a Master’s at San Francisco State. As executive director of Wu Yee Children’s Services, he expanded revenue by a factor of 50. He was elected to the Board of Education. He was elected president of that body. He was elected to the Board of Supervisors. And, now, he has been elected president of that body. 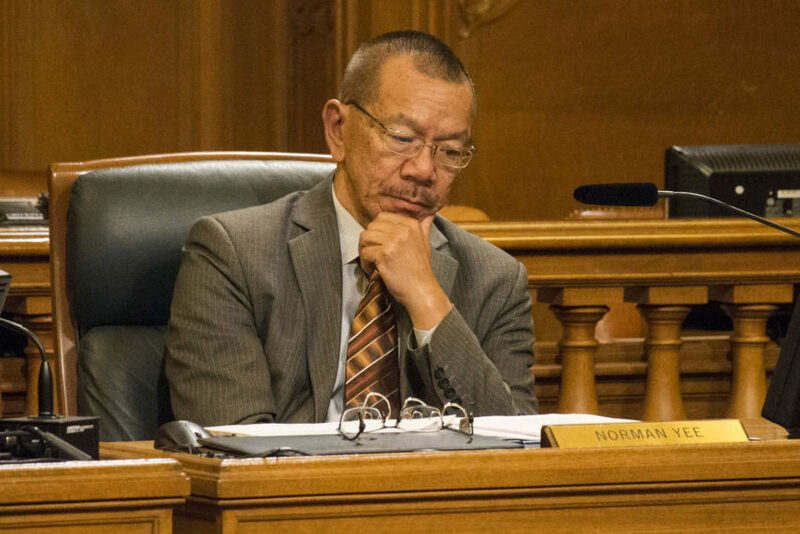 Norman Yee currently occupies the plum second-floor corner office at City Hall. He has come a long way. But he also hasn’t come very far at all: Colleagues and authority figures still peg him as inarticulate and none-too-bright. Yee smiles. He’s 69, a grandfather. He doesn’t punch detractors in the face anymore. Let them do that to themselves. For much of his life, people have treated Yee a bit like he’s Chauncey Gardiner, the Peter Sellers character in Being There, a feeble-minded, inarticulate man who somehow bumbles upwards into ever-greater positions of power and influence. But the more apt comparison may be Detective Columbo — a man whose appearance and demeanor led rivals to underestimate him. Yee glances around his corner office, which is cluttered with half-unpacked boxes containing ephemera from his long history of being underestimated. 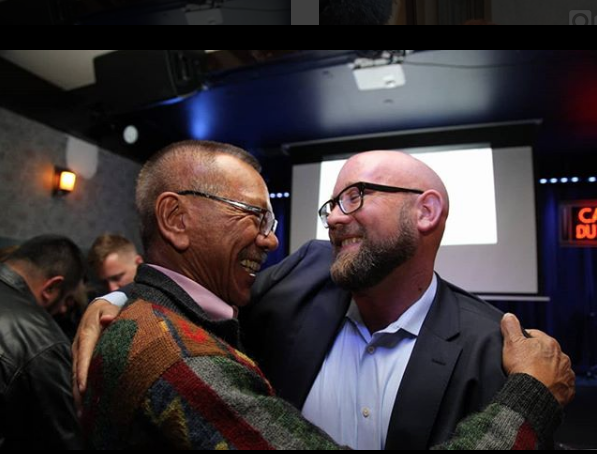 Norman Yee congratulates Rafael Mandelman on election day. Photo by Abraham Rodriguez. 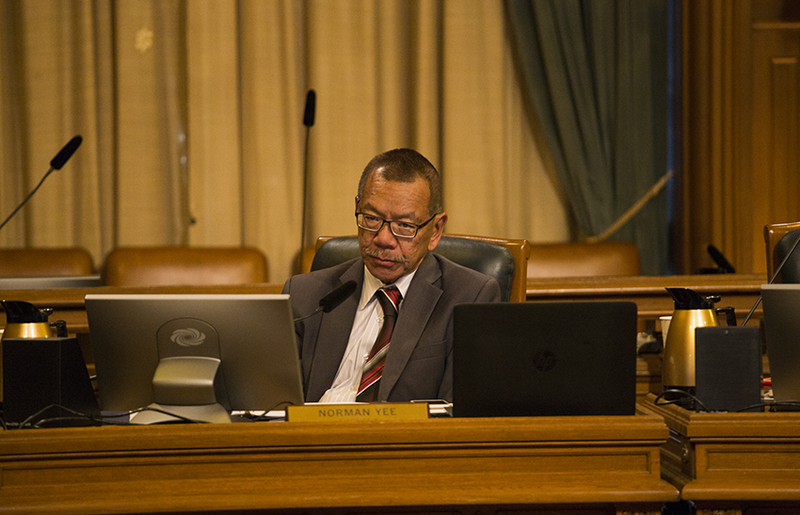 Despite the intrigue and vituperation surrounding this month’s board president election, Yee’s path to the office appears to have been essentially straightforward and without artifice. He asked his colleagues to vote for him. They did. Whisperings that Yee cut deals in exchange for votes seemed especially implausible after his committee assignments came out last week. Yee straightforwardly created the most progressive-leaning board committees since 2010, with assignments in part weighted by seniority. And yet, Yee is also amenable to shifting the wealth, i.e. taxing the wealthy to aid the less fortunate (“I think we have not pushed the limits yet,” he says, regarding revenue measures). He was a driving force behind June’s Proposition C, which boosted taxes on commercial property to fund early childhood education and wages for childcare workers. For Yee to observe the field from the periphery while others more vociferously push for shared goals fits a decades-long pattern of subtle, counterintuitive leadership. Yee is the guy at the party who skulks along the perimeter, doesn’t say much, and takes in the whole scene. He isn’t trying to impress anyone with his smarts or policy chops (or his speechifying). His prerogative as a leader is to attempt to keep things on track rather than to drive the train; he sees himself as a human cooling rod who can prevent a meltdown when things threaten to bubble out of control. “I wait for an opportune time to be useful,” he explains. “If I were the mayor, I’d be nervous about getting a budget through this guy,” notes a veteran City Hall observer. “Norman could make for a very interesting dynamic. 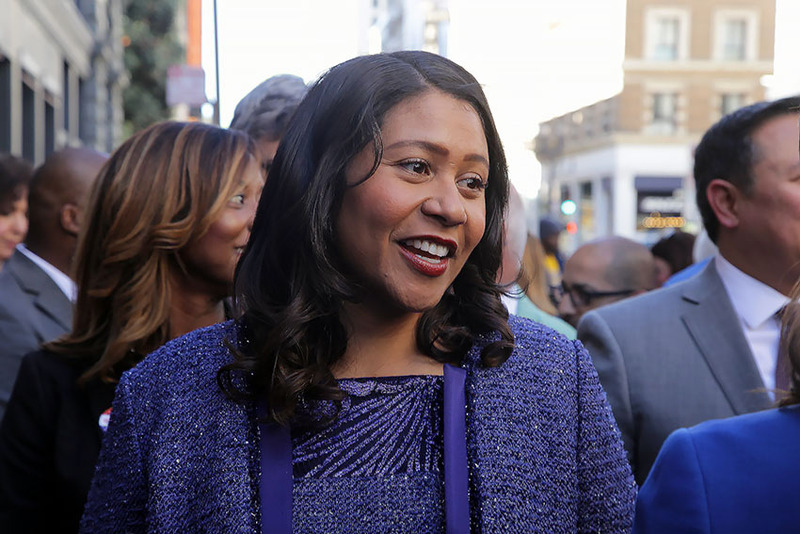 He’s not going to go along to get along.” Photo of Mayor London Breed by Abraham Rodriguez. And, by the time the city’s next budget is sealed in June, nearly every union contract must be negotiated. Also, of note, Breed is running for re-election in November. It would certainly behoove the mayor for the former situation to go smoothly, perhaps ensuring the latter does, too. Counterintuitively, Yee might be a more problematic board president for the mayor’s office than a more traditional, labor-friendly “progressive” legislator. ‘Just one more thing…’ Photo by Lola M. Chavez. “I don’t ask for something I don’t really want. And I don’t ask for something I don’t think I can do,” he says of the board presidency. Come back to him in a year. See if he was right. Yee will be a vastly superior BOS President than Ronen could ever hope to be. Yee worked hard on many issues, from housing to transit behind the scenes. His one failing was what he inherited from Sean Elsbernd… the mess of transit improvements to be shovel ready on 19th Ave, and loss of housing to SFSU-CSU and Parkmerced’s development. He could have pushed harder on those issues. Now he has a chance to ammend those concerns and require equitable investment in transit and push the land-use concerns and investment for essential housing needs. Wait and see what is cooked up in legislation….